Yesterday Jason Clarke at Download Squad published his take on clearing a bulging Inbox. His process, deemed Inbox 0.5, involves decreasing the number of messages in your Inbox by half every day until it’s cleared. If the psychic weight of being an Inbox Piler is taking its toll, there are a number of similar recommendations for clearing your Inbox and getting to zero email bounce. In addition to Jason’s Inbox 0.5, there’s Merlin Mann’s Email DMZ (Michael Linenberger recommends a similar process) and Deva’s Ten a day plan. Use ClearContext IMS to prioritize your entire Inbox. Switch to the ClearContext Prioritized view (ClearContext > Inbox Views). Highlight all messages in gray. These messages are from unknown senders, are not addressed directly to you, and are likely spam. Delete all of these messages or alternatively move them to a processed mail folder if you are worried about missing something. If you really want to clean house, consider removing all messages in black as well. These are still from unknown senders and/or were not sent directly to you. Highlight a newsletter or other informational letter in the Inbox. Select ClearContext > Create AutoAssign Rule from Message. Craft a rule that will assign a Topic and file to a Topic folder. 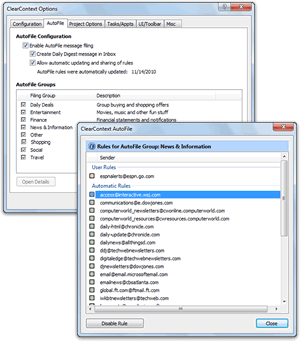 Check Apply rule to Inbox messages now and click OK.
Repeat for additional newsletters, corporate announcements, etc..
Make sure are in a ClearContext Prioritized view. You may need to switch to Prioritized by Week or Prioritized by Day if you are finding stale messages at the top of the Inbox. Follow the steps in the Manage phase of the IMS Daily workflow to act on your remaining messages conversations. IMS will automatically group all message conversations together to ensure that you don’t repeat work that someone else has already completed.